As designers, we always look forward to gauging the upcoming trends. It’s essential to stay ahead of the curve to create stunning designs that are impactful to your clients. Here are 5 graphic design trends of 2019 we believe you’ll see heavily used in 2019. Graphic design trends have somewhat shifted to reflect more of our humanity, accepting our individuality and collective unity, specifically in marketing. 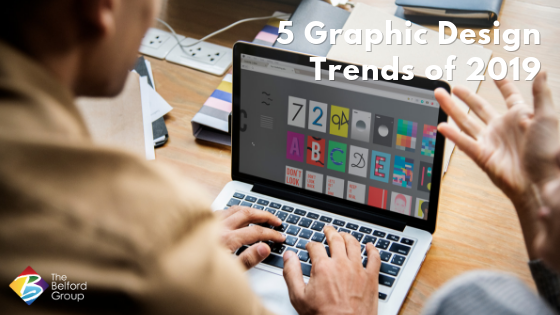 Expect to see graphic design trends of 2019 to increase in incorporating humans within design in the manner of creative photography, illustration, and icon design. Humanity has drawn even more emotion into a design, helping the user to truly relate to the subject manner and desire to be more like the subject in question. This trend is no surprise to many, as beautiful and creative use of typography (type) has dominated the design field in recent years. This trend continues, but we’ll see an increase of use of individual letters used as windows into the design. Typography will also become forefront in graphic design trends of 2019 through the oversized use. Remember, it is essential to keep type readable first and foremost. If the user becomes confused reading type displayed, the desired message is muddied and often lost. Take a deep breath. This design trend is one of our favorites, as it acknowledges the incredible power of white space. Negative space creates an immediate user interest and often drives them to spend more time looking at the design than another with overfilled content and imagery. It gives the user the opportunity to see a heightened message through the negative space. As you’ve noticed in recent years, gradients have become increasingly popular as major brands incorporate them into their identity. Specifically, in 2019, we’ll see a shift to predominately two-toned gradients. Gradients evoke a lot of emotion within a user, as color continues to dominate our culture. Chances are you’ve seen this trend in product packaging without even realizing it. Mono-color is the use of a single color in different shades or hues. Often-times, a gradient is used to blur the edges of an element in front with the back, making the user stop to look more closely at the image. This trend will also be seen more in website design in 2019. What’s your favorite design trend of 2019? Do you have a favorite that we haven’t listed here? Share your thoughts below; we’d love to hear from you! For all your design needs, contact The Belford Group today at 479.443.9945.